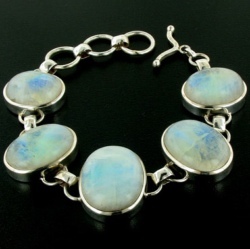 Rainbow moonstone is considered sacred in India and for many people has mystical properties. It's schiller is a glowing blue light that travels through the stone. The stone surface is whitish and often cloudy, sometimes clear. Inside the moonstone, sometimes shafts of rainbows come and go. See About Gemstones for more information. 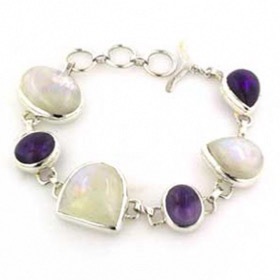 A moonstone bracelet is many bracelets in one! Explore our entire collection of moonstone jewellery. 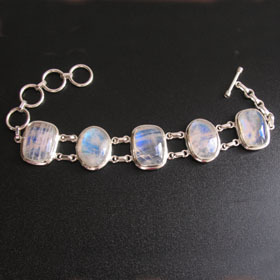 We concentrate on rainbow moonstone but there are different types of moonstone in opaque single colours. 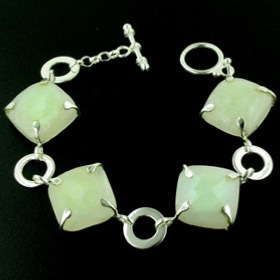 Free delivery on your moonstone silver bracelet.